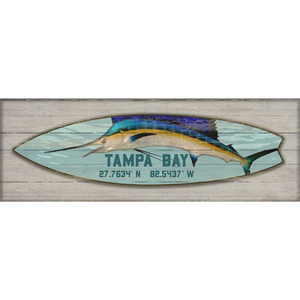 Suzanne Nicoll's coastal marlin surfboard image printed directly to a distressed wood panel. Marlin Surfboard- Printed directly on distressed wood panels that have knots and other imperfections in them. We end up printing right over these imperfections which gives each panel interesting texture and character. No two are the same! Life doesn't get better than a great day surfing. Coordinates will be added exactly as provided. White Coral Reef Indoor Outdoor Rug, 22 x 34 in.